Lighting control. Appliance control. Scene control. Z-Wave control. There are thousands of Z-Wave devices that you can have in your home, but controlling them is never natural. Typically, you have to pull out your mobile phone or boot up your computer. WallMote brings natural, intrinsic control to the connected home. WallMote is the perfect Z-Wave controller. Wireless. Battery powered. Designed like a wall switch, but capable of controlling hundreds of devices of over a dozen Z-Wave scenes. 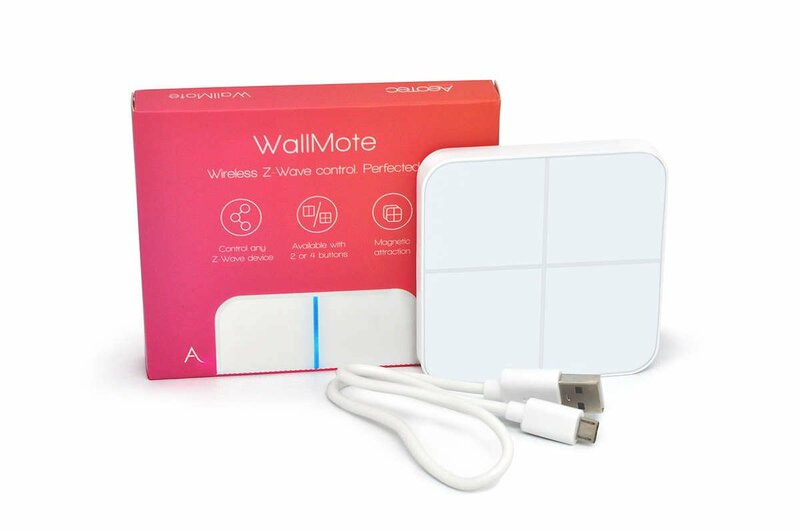 The Quad WallMote switch from Aeotec is a portable, wall-mounted, smart Z-Wave remote controller. It has 4 touch-sensitive buttons giving easy fingertip control over your Z-Wave appliances by touch, press and hold or sliding touch on the button areas. Its surface is fitted with an RGB LED to indicate button actions, that are also accompanied by audible feedback and vibration. The WallMote Quad is also a security Z-Wave device and supports Over The Air (OTA) feature for the product firmware upgrade. WallMote can trigger corresponding functions by a single click. Furthermore, it masters 'sliding' control. This touch control system allows you to swipe with a single finger across the relevant area on the WallMote to dim the lights by intuition for instance. The battery powered touch switch comes with a magnet that enables keeping the device in the respective wall mount. In this way WallMote becomes a wall switch. You also can take the device away and use it as a portable remote control. By using Aeotec WallMote you are able to control devices and scenes in your smart home easily and intuitive at the wall as well as in your hand. By using WallMote as fixed wall switch or portable remote control you can switch other devices as well as trigger scenes. Furthermore, the touch control system allows you to swipe easily across the touch area on the WallMote - in order to dim the lights.